It’s many days gone but still, the hype around the movie ‘Phone Swap’ is enough to ensure that we’re still talking about it. From the premiere of the movie at the Expo Centre of the Eko Hotels & Suites in Lagos, we bring you what worked and what didn’t plus a quick review. The movie made it all worth it—with ‘Phone Swap’, Kunle Afolayan might have taken a leave of absence from his usual movie fare, but his dexterity as a filmmaker is clear. We waited impatiently for the movie itself to start, but when it did, it was well worth the wait. Olisa Adibua might not be your favorite on-air personality, events anchor or martial arts instructor (couldn’t resist that dig), but you can’t say he doesn’t do a competent job. The unusual combination of himself and Gbenga Adeyinka worked—the ‘Comedian of the Federal Republic’ was able to step in time and again, just before the crowd began to yawn. The red carpet sizzled, if you will forgive the cliché. Everyone from Nse Ikpe-Etim to Kate Henshaw ensured photographers had more than an eye-full. 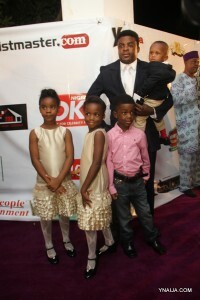 And Afolayan’s kids were oh-so adorable. The event began quite late. Unnecessarily if you ask me—as we were stuck with boring choreography (people still do that?) and music. W4 (some have called him a Fela wannabe) also felt flat with a poorly mimed song. The hall could have been better filled—after all, this was Kunle Afolayan, easily one of our brightest and best, and the tickets were affordable. And this was a Sunday. Was the event a victim of too much hype? Did the AMAA nomination party steal many of the guests? We still can’t get this right? The premiere would have been better if more efforts were put into stage craft and lighting. With the absence of spotlights and the whole works, sometimes you found yourself squinting to glimpse who was standing on stage or what exactly was happening. Not cool. So yes, the show was well worth the hype, and Kunle Afolayan is still the man to watch. Now it’s up to the box office, but here’s a short review to act as a guide. This is a breath of fresh air, let’s get right to it. It steps as far away as possible from the usual fare of bad scripts, tacky costumes, horrendous locations and the usual boiler plate claptrap that riddle the Nigerian movie scene. Wale Ojo, star of British sitcom ‘Meet the Adebanjos’ and the latest Johnny English movie, plays Akin in his first leading role in a Nigerian movie. He carries his character well—Akin, the opinionated and self-centred king of the road, who is at war with everyone in his life, from mother to co-workers. Then there’s the alcoholic—and well-endowed, that has to be said—girlfriend complicating the strained relationship with his mother, played by the immortal Joke Silva. The result? Drama overload. Nollywood’s next sweetheart Nse Ikpe-Etim plays the simple girl (Mary) living in a not-so-simple world—and delivers in her role as the kind, girl from the village—talented and the backbone of her ungrateful boss’s business. So far, so clichéd. Then it heats up. While rushing to Abuja for a company retreat, Akin (Wole Ojo) bumps into the naive Mary who is also in a hurry to visit her family in the village in Owerri. She has been summoned by her father (the famous Chief Zebrudaya) to settle matters with her troublesome sister (Ada Ameh) and husband. Topping off all of these are Mary’s hilarious twin brothers; Alpha and Omega. Their phones accidentally get swapped in the frenzy, and with them their destinations, and their lives. Fine premise, expressed competently with a story-telling style as simple and elegant as the movie’s posters. The suspense is well complemented with a pulsating soundtrack and the ability of its cinematography to bring you as close to the movie as is possible. Afolayan tasks himself as well in balancing the pace of urban existence against the inevitable calm of the rural; contracting simplicity with complication in a manner that certainly gives him credit. Also creditably done is the expert marriage of emotion and humour. Mary has never been to the airport before so when they asked her 'Nnamdi Azikiwe', she said yes cos she thought that was in Owerri. @ KuRosawa, i agree with u, but to an extent. some focus actually fell off, but some were made to do so, for story telling.and i tell u, u wouldnt have known how much dat focus tin had helped to drive d Story home. and point of correction, an SLR was not used for filming. its ofcos a very large sensor frame camera, but surely nothing in d league of the SLRs, it was shot 4K. The story is humorous, well told, and ingeniuos visual story telling techniques. I however advise that the DP needs to work on focusing princpal objects, the focusing went very dodgy at some points, i understand the challenges of our modern Digital single lens reflex technology, but with a lot of rehearsals, the DP can get it right. Great Nigerian movie, thumbs up Kunle, another first u have scored. I am shocked that U didnt dominate the AMAA nominations. Have seen d movie, n my question is, aw did mary's destination get swapped, she was supposed 2 b going 2 owerrin aw did she end up at abuja counter. Secondly, why did she have 2 pay 26,000 again, since her boss already gave her a 2way ticket. Akin' s destination swap is understandable, since he was going by a lead.